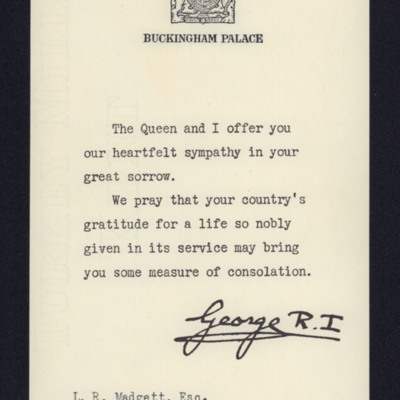 Lester of condolence from King George on death of Hedley Madgett. 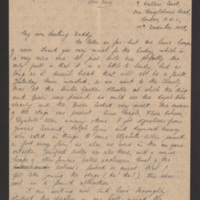 Letter from King George VI appointing Ron Mathers as a Pilot Officer. 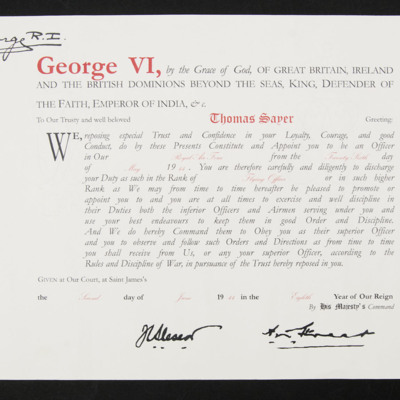 Letter from King George VI appointing Ron Mathers as Flying Officer . 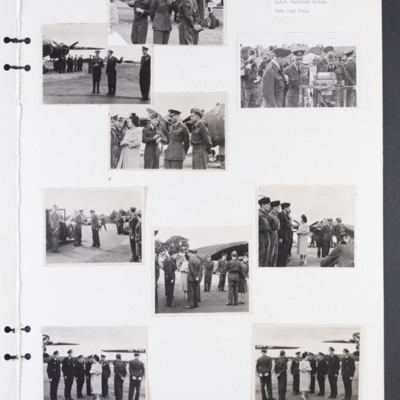 King George VI, the Queen, and Princess Elizabeth meeting aircrew personnel. 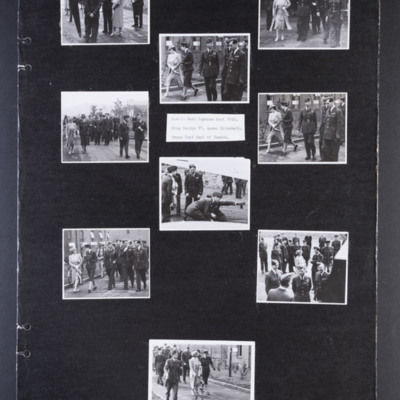 Ron Doble is standing behind them, marked with a cross. 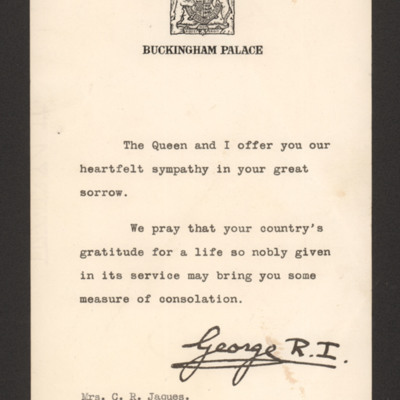 Notes that the King will hold investiture at Buckingham Palace on 20 November 1945. 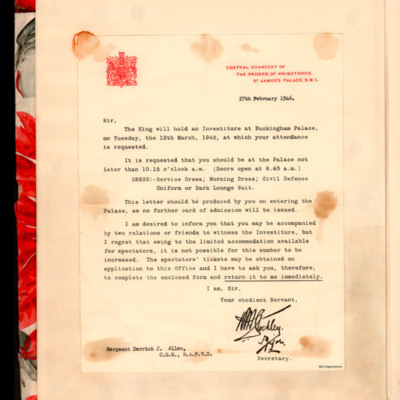 Donald Cochrane requested to be at palace no later than 10.15. Goes on to detail dress and who may accompany. Letter offering sympathy and consolation to Mrs C R Jaques. Head and shoulders portrait of King George VI in uniform of Admiral of the Fleet. In the background drawn curtains. 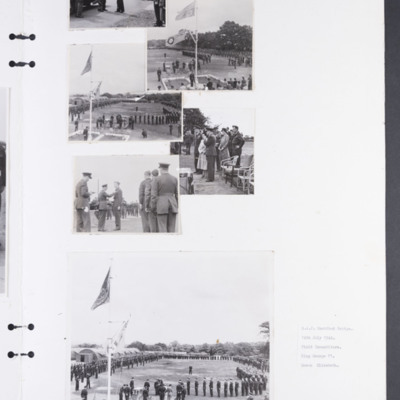 King George VI in RAF uniform shakes hands with a sergeant at the near end of the rear rank of airmen parading on grass. 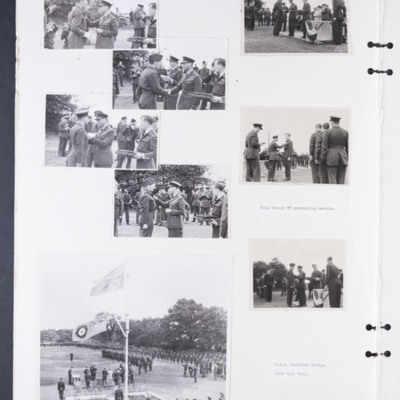 To the King's right, two other RAF officers. In the background Venturas are parked in two lines. 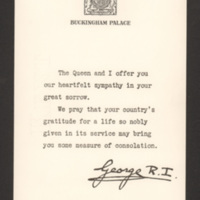 Letter of sympathy from King George VI to Mrs L Boldy. 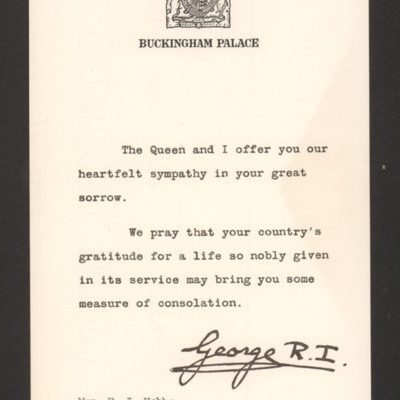 Letter from David Boldy to his father about Charity Show held at the Winter Garden Theatre in London; the king and the queen were present. Will be visiting Aunt Maisie’s for Christmas.